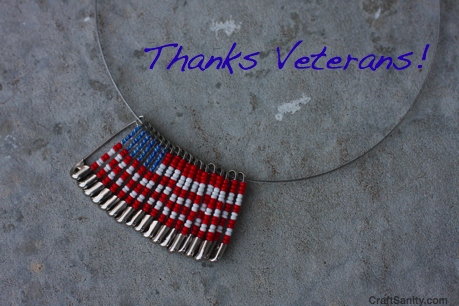 This craft tutorial is in honor of Veterans’ Day, the day we pause to remember and honor the men and women who have made great personal sacrifices to defend our freedom. In an effort to reflect on what it means to be free in America, I thought it was appropriate to make some beaded lapel pins and pendents with my kids. Ok, here’s what you need to make a flag pin or pendent. Step 1) Load 16 seed beads onto each of the smaller safety pins as described below. 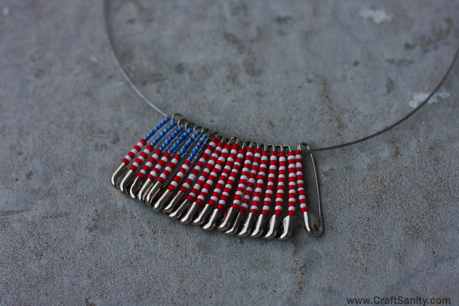 On six safety pins: Place 6 blue beads, followed by 2 red, 2 white, 2 red, 2 white, and 2 red beads. On remaining 12 pins: Place 3 red beads, then 3 white, then 2 red, 2 white, 2 red, 2 white, and 2 red beads. Step 2) Once you have your pins filled with beads all you have to do is string them in order onto a necklace or large coiless safety pin to form a flag. * Note, you can use a large safety pin with a coil. But then you’ll have to use a pliers to loosen the coil so you can wind the beaded pins to the front side of the large pin. Otherwise you will be unable to pin the flag to your lapel because the beaded pins will be in the way. I made a second version of this flag where I stuck to a 1 red, 1 white striping pattern. So experiment to determine what you like best. And don’t stress over trying to make the flag proportional. Just have fun with it and wear your flag today in honor of all those who fought to protect it. We absolutely love your blog and find many of your post’s to be exactly I’m looking for. Do you offer guest writers to write content for you? I wouldn’t mind creating a post or elaborating on most of the subjects you write with regards to here. Cool web log! Greetings from Los angeles! I’m bored at work so I decided to browse your site on my iphone during lunch break. I enjoy the info you provide here and can’t wait to take a look when I get home. I’m amazed at how fast your blog loaded on my mobile .. I’m not even using WIFI, just 3G .. Anyhow, awesome site!